The International Geoscience and Remote Sensing Symposium is a premier event in remote sensing and provides an ideal forum for obtaining up-to-date information about the latest developments, exchanging ideas, identifying future trends and networking with the international geoscience and remote sensing community. This year it is taking place in Valencia, Spain, with the theme "Understanding and Forecasting the Dynamics of our Planet" (https://igarss2018.org/). Partner AUTH is presenting "Spatial enhancement of MODIS Leaf Area Index (LAI) using regression analysis with Landsat Vegetation Index". 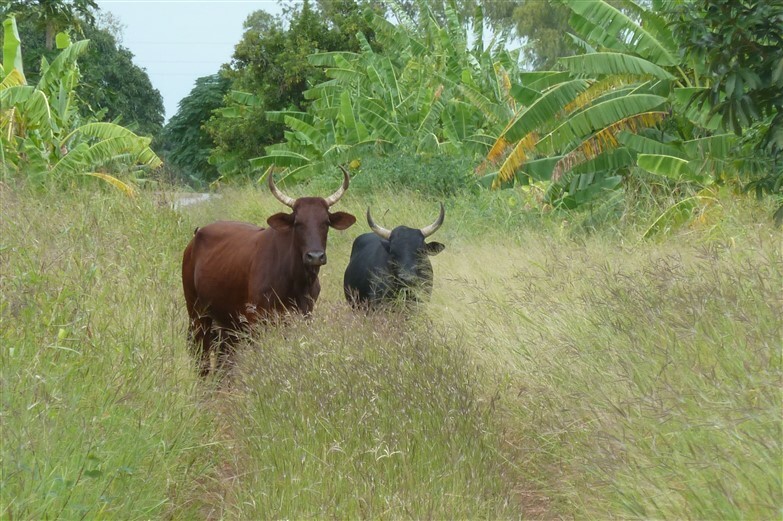 The aim of this study was to enhance the spatial resolution of the MODIS LAI product using a downscaling model that combines Enhanced Vegetation Index and LAI images from the two satellites. 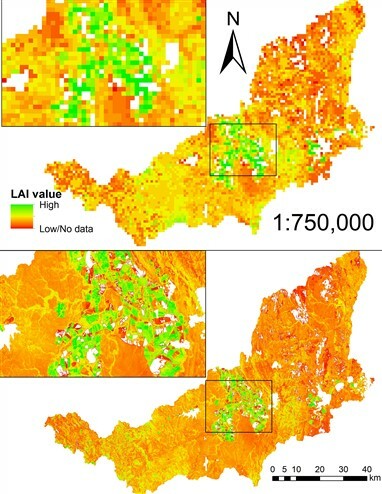 The results show that it is possible to use this methodology to reliably estimate LAI at a 30m spatial resolution across various climates and ecosystems, thus supporting a food security early warning system. The presentation is on Friday 27 July 2018, 9:30am. From large to small or from small to large? 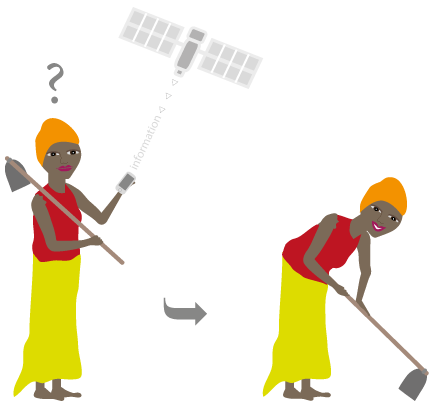 Satellite and geodata applications for smallholder agriculture are quite new, more general apps for smallholders that make use of mobile technology are around a bit longer. A number of these mobile initiatives have been evaluated (have a look at www.gsma.com) and it is interesting to look at the finding to see where geodata and mobile apps could complement each other, also with an eye on new application fields, such as (inclusive) finance. The approaches differ: apps that originate from mobile network operators (MNOs) tend to go for reaching large numbers of farmers quickly and then adjust the content, while the geodata service providers start small to get the tech aspects right and then go for scaling up. Mobile apps struggle with correct profiling of smallholder farmers, which have a negative effect on the relevance of the advice given. Satellite information and geodata acquisition on the ground can help improve this by providing regular data on what is where (which crop) and on what is happening. This is all the more valuable, as response on profile data provision by farmers themselves is limited. Satellite apps can improve the relevance of information, such as timely and regularly updated local weather forecasts. The information is often perceived by smallholder as too general or as not provided at the right time. A combination with local weather observations by farmers themselves, such as currently in a test phase in the Rain4Africa (R4A) project in South Africa (http://www.hydronet.co.za/rain-for-africa-project-r4a-2/) , makes this especially interesting. The improved accuracy (both in time and place) of information derived from satellite data helps making advice more actionable and allows for regular updates. This has been a problem for mobile apps that make limited or no use of geodata. Conversely, geodata-based apps, such as those developed in the Geodata for Agriculture and Water (G4AW) Facility (https://g4aw.spaceoffice.nl/en/) can learn lessons in scaling up from mobile apps that already target large numbers of smallholders. Getting the tech aspects right is important, but reaching sufficient clients to make operations sustainable does not automatically follow from that. Making use of power users (and/or authority figures as ambassadors), keeping the pricing model simple, making the service easy to operate for farmers, using local languages and metrics, taking illiteracy into account and taking care of long-term incentives for those in direct contact with the farmers are important findings from the evaluation of the impact of mobile apps that can be taken to heart in the further development of geodata-based apps. In a fully operational phase the distinction between mobile apps and geodata apps will disappear. My expectation is that the two will be fully integrated, once the geodata apps get behind the experimental stage. Expect this to happen pretty soon!